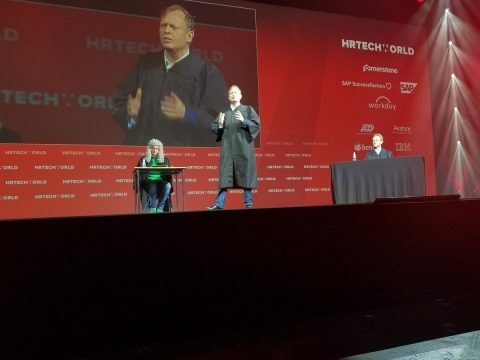 Today Dale was lucky enough to be running the #HRTECHWorld Livestream. 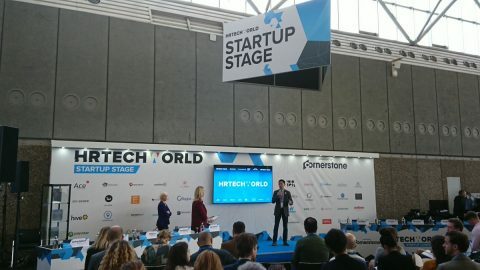 She interviewed over 20 delegates, vendors and HRTECHWorld team members. 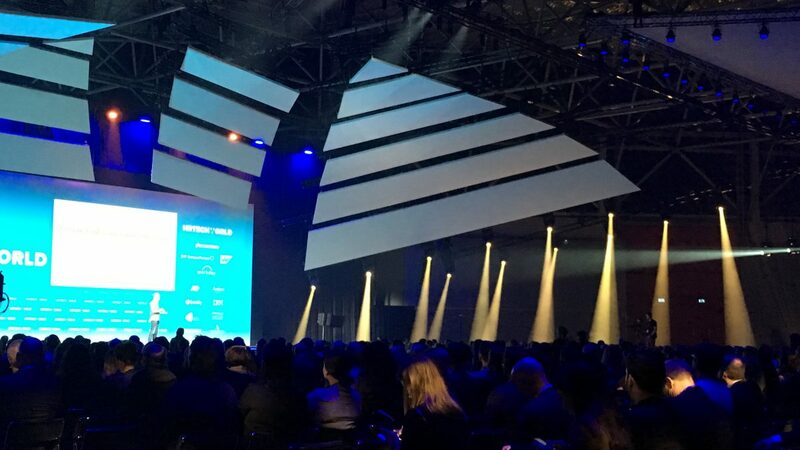 The energy of HRTECHWorld is awesome. This conference has really nailed a strong sense of community. Most popular speakers were economist Dr Daniel Thorniley dropping hard-hitting facts on today’s job market and Euan Semple talking about blockchain. Most Fun Session – The Debate on #bigdata where the three speakers presented their thoughts as if they were in a courtroom – wigs and robes included. What a a fun and engaging way to present this already fascinating topic. Key themes: The tension between humans and robots (aka Artificial Intelligence, Machine Learning and Big Data). All we can think is that the world is on the precipice of enormous change in tech, and HR tech is right there at the forefront. The area for startups, some 40 or so vendors all vying for the attention of the attendees and potential buyers, was never quiet, it seemed like there was always a good level of traffic and some were doing demos back to back for the whole 2 days. It was great to see so many vendors getting their products in front of real buyers from large corporates. And on that note, all you vendors out there, IOHO (in our humble opinions), this event is the best out there. The quality of the delegates and conversations has been a head and shoulders above any other event we’ve been to recently. Not only was the quality of the content amazing, but the effort the various companies have put into making it interesting and diverse. As we sign off, we want to give a massive Weirdly shoutout to the sense of belonging, inclusion, community, networking, support that we’ve felt over the last couple of days. It’s amazing; you truly feel like the team cares about building an event that caters to all parties and ensuring great outcomes for everyone, it’s not just about bums on seats for them. And it can only get better with the new brand Unleash. We’re looking forward to continuing the journey with the team at future events. If you met us at HRTechWorld, or have just been following our adventures from afar, why not try Weirdly for yourself? Book a Demo with Simon right now. 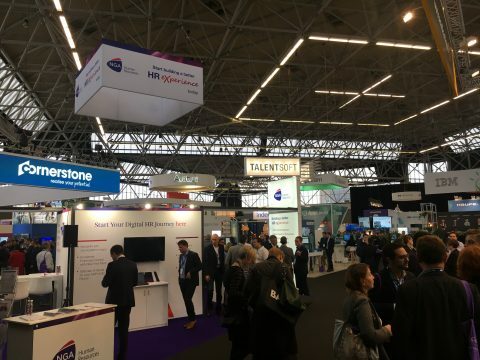 Day one of #HRTechWorld in Amsterdam! 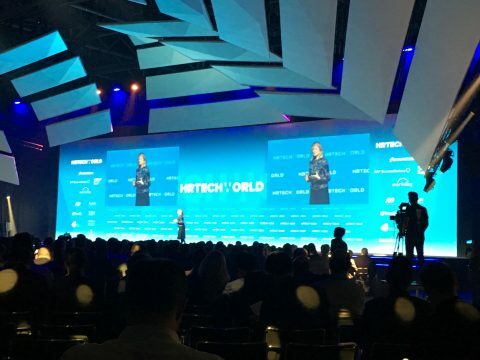 Breaking News: HRTechWorld has just announced a rebrand, to become Unleash! Read all about it here. Thousands of people were early to registration on day 1. Amongst the booming DJ in the entrance hall, you can find a masseuse and the #HRTechWorld creatures. What an awesome start to the day! We felt that Day One was a huge hit. Kicking off with an amazing keynote from Peter Hansen referring to his thoughts (and his book) on The Day After Tomorrow. Are we spending enough time and attention planning for the future instead of just for today? And finishing with the amazing Arianna Huffington. We need to be paying more attention to our “now”, and sleep more. It was such a treat hearing her do a keynote and then also listening to her fireside chat with Josh Bersin. Main themes for today were focused on the #futureofwork and how #HRTech can enable and support Talent Acquisition/Human Resources and culture and diversity. She spoke on on Unruly’s 5 point checklist for Diversity: Measure, Find, Be Flexible, Nurture and Celebrate. Diversity is one of their strengths and their people (“The Unrulies”) live and breathe it. You can tell from their mission statement (“To unleash the collective power and difference of Unrulies to drive business impact”) all the way to how they work. We especially loved “Nurture”; One of the most important purchases they make for their offices is a good quality kitchen table, and they use it too! They actively encourage their people to bring their families in for lunches and to just hangout or check out the offices. Sarah finished with a favourite saying: “Good things come to those who don’t wait!”, we totally agree Sarah! China chaired the panel of extraordinary female tech founders. Some key pieces of advice that they left us with: hire for company values and personality, and as a CEO you must be thinking at least three years into the future. But our favourite, by far, was that the most important attribute you should hire for is ‘self-awareness’. People who understand their strengths and weaknesses are able to be coached and to learn. We couldn’t agree more. Arianna Huffington is a walking sound-bite machine! She tells us to focus on well-being and making sure we recharge our batteries. Stop living our lives through our phones and actually live them, experience the things around us rather than recording it. She’s not just talking the talk, she’s walking the walk. She has partnered with Samsung to create the Thrive App. It’s like an out of office for life, limiting the notifications so that you can go and live your life. Not only is Huffington trying to fix our personal life, but the way we work. She calls the company’s culture the ‘immune system’. If we get a virus or a disease it can spread. The ‘brilliant jerk’ is the poison for our company. A great culture is a strong immune system that can stop that virus dead. Of course, not many people leave work at work when they go home. We take who we are at home to work, and we take who we are at work to our homes. What does that look like? 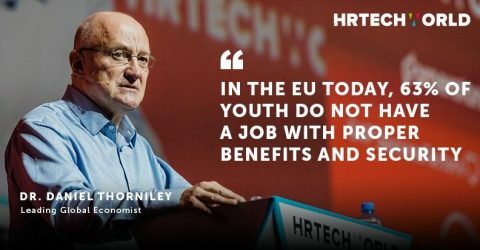 Life skills are just as important as job skills. If we help people transition through their lives, it will teach resilience and beyond job skills, it will establish real life skills. We were part of a speed conferencing session today focusing on Hard Skills and Soft Skills for the future of work. We started by sitting on the floor to warm up in an informal way then got into some speed networking. We were one of six speakers. Topics that were covered were Chat Bots in the recruitment process, using inbound marketing, enabling culture when scaling, the shift from hard skills to soft skills we’ll need in the future, micro-learning and how to buy HRTech. One of my favourite discussions was on whether Talent Acquisition should move into the marketing department. Definite food for thought. 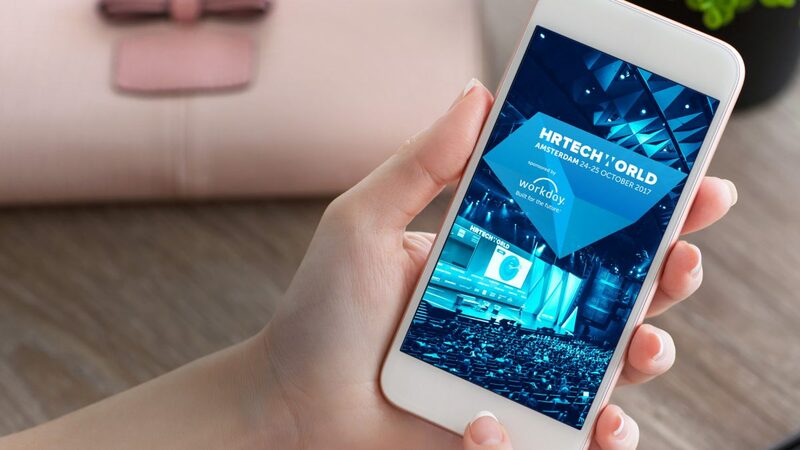 The expo hall is massive: so much great HRTech, we’ve tried to summarise some of our highlights, but the whole day has become a massive whirlwind of excitement! 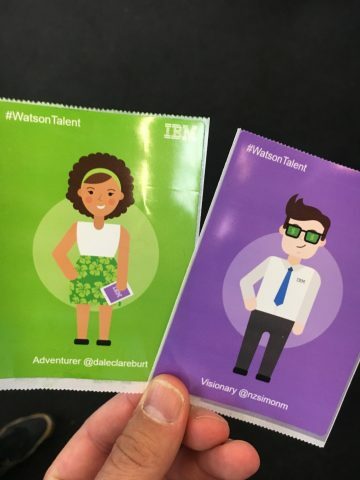 IBM’s Watson used our Twitter profiles to tell us what our personality type was (Dale – Adventurous, Simon – Visionary). BeeKeeper – An employee communication app that we got a rave customer review about. It enables secure communication between employees and teams. The customer stated that it has increased active engagement and productivity across the entire company. Devscore – Cool product that simplifies developer acquisition and assessment. And the founder Peter Cummings is worth having a beer with. 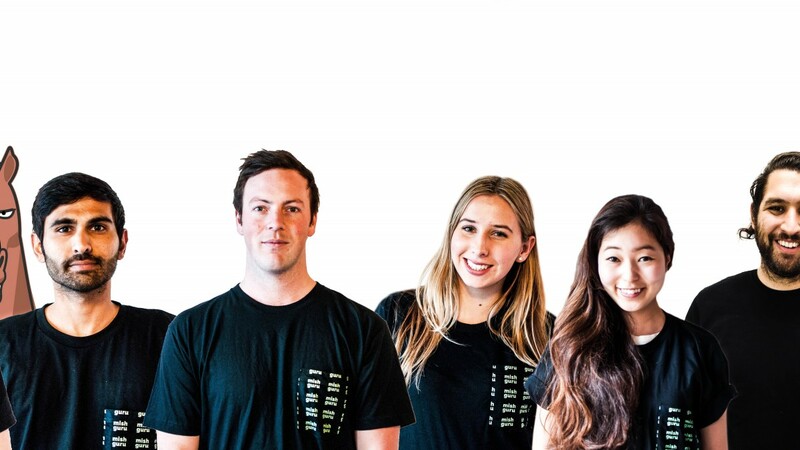 So excited for our friends at Enboarder who were runners up in the startup competition from a lineup of over 25, but Robot Vera were the overall winners – They are using AI to replace 90% of the recruitment process. They find the candidates online, make contact and then a robot will phone them before forwarding a shortlist to the recruiter. Hmm, we’re not sure on this one. Really takes the human element right out of it. Hot tip: Keep hydrated – Get a free water bottle from one of the vendors in the expo hall and fill it up at the water filters. 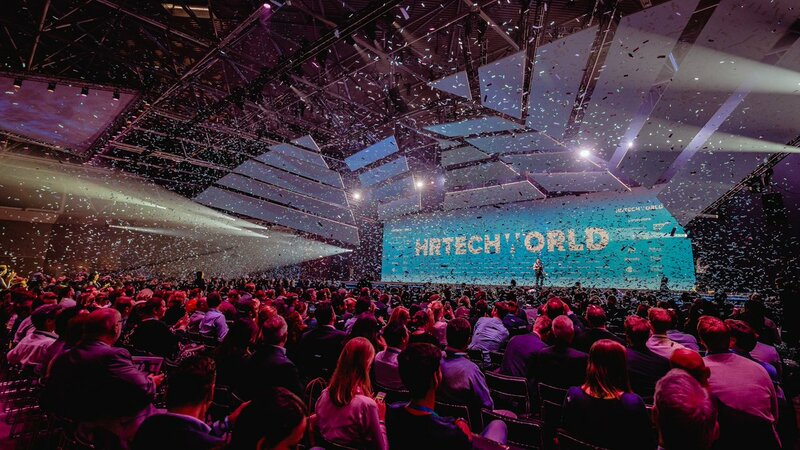 We are so excited to be sending two of our Founders to #HRTechWorld in Amsterdam! It will be the Best HR Show in the World! In fact, if you check out the agenda, you may notice a familiar face, right there, next-ish to Ariana Huffington, you’ll find our very own Weird-One-in-Chief. 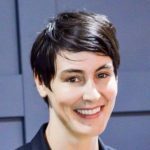 Dale Clareburt will be talking through what soft skills you need to focus on and why the soft skills we look for today may be a different kettle of fish tomorrow. Dale isn’t a lone-wolf this time though, we are also sending Simon Martin to be her partner in crime. 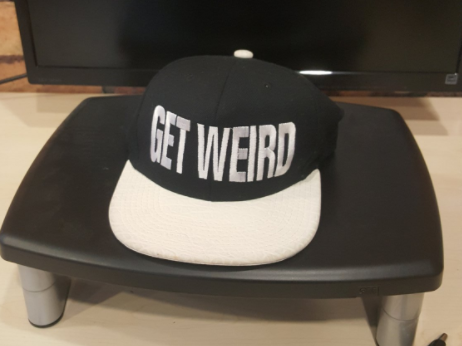 They will have a supply of Weirdly hats, so find them and you too can look cool like us! And if, like the rest of us, you’re not going to be in Amsterdam… we will be bringing you all the highlights. Here on this blog, or on our Twitter, Instagram, Facebook and LinkedIn pages. In fact, if you’re not a member of our recruitment Slack group, people-people, come and join us, we’ll run some AMA and post the links to the live-streams as they happen. Let’s check out the #futureofwork together! Last night our co-founders Dale and Simon hosted an energetic and exciting rendition of Family Feud, with a recruitment twist (of course) at the #sydRecMeetup. The whole evening was sponsored by LinkedIn, Enboarder and ourselves. The anticipation was well and truly built up before the event, the venue allowed us to have 120 and we maxed that out. (Not to mention a wait list a mile long). We’d also like to give a #shoutout to Troy Hammond of TalentArmy who gave us the idea to begin with. And a massive #shoutout to Chris Long, Mark Mansour and Neil Gunning for inviting us to be part of it all. 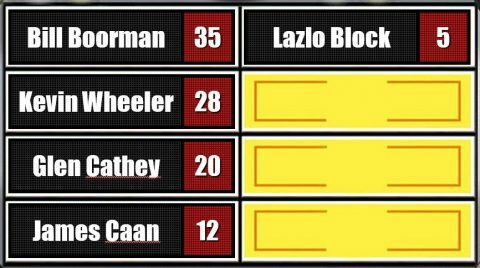 There was a whopping twelve rounds so here are some of the highlights. If you’re a talent hunter in Sydney you can watch the whole thing on their closed Facebook group here. Who are your key influencers in the talent acquisition community globally? Round One kicked off asking about key influencers. When social is key to getting your brand out there, it was no surprise that Bill Boorman of the Recruiting Unblog came up on top as the most popular answer. We’re big fans of Bill already but thought that there were a few key names missing off this list like William Tincup and Stacy Zapar. There are really so many to choose from. What are the key factors that affect the candidate experience? This question is near and dear to our hearts. Here at Weirdly, we are all about the candidate experience. 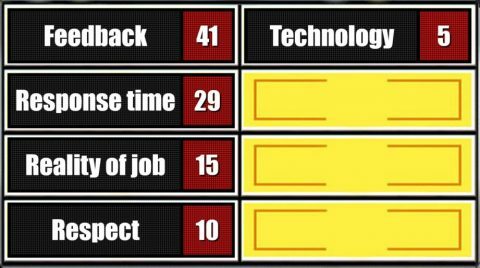 We like to think that our software makes your life as a recruiter simpler, which should give you more time to provide feedback! Our automagic filtering that happens whether you have a hundred or a thousand applicants should also cut your response time by the bucketload. What are the top ways you would measure your employer brand? These are all awesome ways to measure your employer brand. We totally agree! 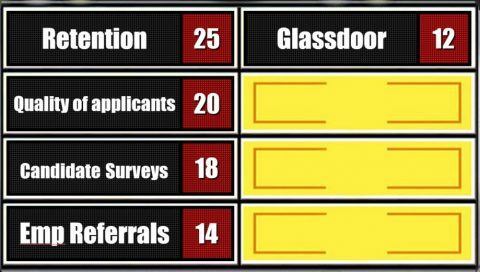 A strong employer brand will increase your staff retention and you will get a better class of applicants through the door. Here at Weirdly we help you build the culture you want to have. That’s your brand of weird, and it should help you attract and keep the very best people. If money was not a constraint, what would you invest your budget in? We love the utopia question… people always get that dreamy look in their eyes and that faraway smile.We’re also glad that the superyacht didn’t make this list, what a dedicated bunch of talent professionals. 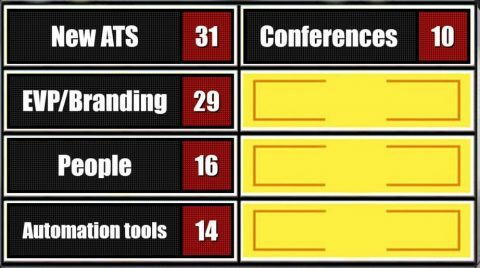 For some of you larger corporates, a top notch ATS is vital, but we’re glad to see that Branding and People are high up on the list too. If you missed the night, I’m sure you’re keen to find out who won… It was a close call, but the audience chose the girls this time round. It wasn’t all a serious competition though, there were some very memorable moments including Gareth Davies from Enboarder singing his heart out whilst experiencing technical difficulties during his preso or Chris Long throwing a highly sought after Weirdly cap over his shoulders to a feverish bunch of groupies at the end of the night. I think it’s safe to say that the Sydney Recruitment Community is very much alive and well. It was a blast coming across the ditch to host, and now there is such an amazing Powerpoint, it’d be sad to see it go to waste, there’ll probably be a re-match at some stage. Welcome to the first of Weirdly‘s Kiwis-Doing-Cool-Stuff-Overseas series. We thought that was a bit of a mouthful, so we’re calling it #globalweirdos. Today, we’re profiling Tom Harding from Mish Guru. These guys help make it easy for companies to create, build and manage Snapchat campaigns online. An actual godsend for anyone who has ever tried to manage a snapchat campaign using just the mobile app (spoiler: It’s impossible. Don’t try it). We met Tom while Keren was over in NYC and, aside from his superbly groomed beard, we were struck by how perfectly he embodies that Kiwi “get in there and give it a hoon” spirit. Of course, it helps that his company, Mish Guru, powered the Snapchat marketing component of the ground-breaking Fletcher’s “Blind Recruitment” graduate campaign, and they’ve just announced a new partnership with Spark (another Weirdly user). Looking back, what’s an event – or person – that contributed to you becoming the kind of person who would start a company and take on the world? This could be something that awoke a curiosity in you, or a person who made you think bigger and be bolder. I’d always been interested in Entrepreneurship but it really wasn’t until a classmate and I entered the Canterbury Uni business planning competition, Entre, that I’d considered it a genuine career opportunity. We managed to take out the top prize and I was hooked. The point where I realised that even Kiwis could take it to the world came a little later. After Uni I was lucky enough to land a role with Ben Reid who at the time was the Chair of the Canterbury Software Cluster. The was no light bulb moment, but being constantly surrounded by other world class companies the realisation came to me that if these guys could do it then so could I. Where are you based now and why’d you choose that spot? We tried a few different spots out around the US and it quickly became clear it was true that NYC is the heart of brand marketing and advertising. I still don’t think it is 100% necessary to be in the same city as your clients, but in the startup game you do need to give yourself the best possible chance to find those serendipitous opportunities. What’s the craziest thing you’ve seen, since living in this new city? Thats a tough one in this city. There’s something new and weird happening on every corner. You walk 5 blocks and sometimes it feels like you’ve changed country. Can you think of a time where being a kiwi – whether it’s having an accent or a different perspective on the world – has really worked in your favour doing business overseas? The kiwi accent comes in handy almost every day. It might seem like a really simple thing but it’s such an effective tool as an ice breaker. Is there a time where the opposite is true (being a kiwi has made it kind of hard)? I’m not sure if this is a product of tall poppy syndrome back home but I think the culture of under selling ourselves really hurts kiwis, especially here in the US. It takes a fine balance of being proud of your achievements and not coming across as arrogant, but there is a definite readjustment needed when you hit the ground here. Have you raised US investment? If so, what’s one piece of advice you could give to kiwi founders looking to do the same? Has being overseas reinforced or changed your perspective on NZ in any way? Looking at it now it seems stupid but one misconception I personally had was that teams here in the US were somehow better than us at software. Sure they might have advantages in other ways (access to market, access to capital, etc), but having spent some time here I now realise that both the ideas and the teams in NZ can roll with the best. If anything I think we’ve got a real advantage with our lower cost of living, high quality of life. The whole timezone thing is pretty much a non-factor. If you know any other cool, global kiwis doing crazy stuff overseas and leaving inspiration in their wake, we want to hear about them! Let us know their name on twitter (@weirdlyhub). If you’re not using Weirdly for your hiring, check us out here. We’ll change your life (in a really, really good way).